Regardless of who won the election, human rights matter above all else. A popular refrain is that these are the "everyone gets a trophy people" that are complaining, and it is not. It's the people that have to constantly deal with fear, with people that crap all over them and their lives. We've elected a VP who has espoused that you can "reprogram" people who aren't heterosexual, and a president who feels that he can trash people who don't meet his standard of "attractiveness", among other things, without consequence. They don't worry me as much as the people they have emboldened, though. Amongst my own friends I still see people posting that our current president needs to go back to Africa, and that everyone that doesn't accept both Trump and God needs to leave THEIR country. Facebook posts pale in comparison to things we're seeing in the news, but they are a good indicator that the problem is deeply ingrained, even amongst the people we know and love. Please don’t misunderstand me, I think we can move forward with this administration. Trump, after all is said and done, is a lifelong liberal elite Democrat. He saw a path to the nation’s highest office, and used his salesman’s gift to make it a reality. He only gives lip service to conservative ideals, and I think that the hue and outcry we’re hearing now from the anti-Trump voters will be nothing compared to the outcry we will hear when his backers wake up from their angry fever dream to realize it. After less than a week of touring behind the scenes at his new gig, we’re already seeing him walk back all of the major campaign promises that got him where he is. Why is that? Because it doesn’t take very long to realize that the job of the presidency is unimaginable to anyone who hasn’t been POTUS. You just need to dip your toe in the water to know that the water is deeper and the current is stronger than anything you could have ever imagined. Trump will roll with it, he has the ability, he has the smarts. He will need to narrow his focus and concentrate on what is really important, and he will have very little time or energy to "mean tweet" going forward. But stopping the "mean tweets" isn't all that needs to happen. What has to happen for this country to move forward is that our new President, along with all those gators in the Washington swamp, on BOTH sides, have to make it clear that they support everyone in this great country, no matter who they worship, or kiss, or vote for. And that intolerance has to end. Both parties, from the top all the way down to the voters, have to understand that we all need to compromise to get along. That’s the big change in our country, the big difference that has created this mess we’re in; both sides have become intolerant of the other, and they emphasize that point by voting out any politician who compromises with people they disagree with. This is what creates the gridlock and the problems, and stops our country from moving forward. We have met the enemy, and it is us. Without compromise there can be no change. We are never guaranteed that we will have candidates for any office that we agree with, never, but things need to move forward none the less, and for that to happen, people need to vote, compromise needs to happen, and tolerance needs to rule the day. "Thanks for listening" and "Go easy"
On the stump today in Sioux City, Iowa, Donald Trump declared that Hummus was un-American and urged his supporters to immediately boycott the product. "I have it on good authority that this is a very popular food in most parts of the Middle East, very very popular, and many people have told me, so many people, that hummus is primarily what is eaten by Islamic terrorists. It's huge"
He went on to say that carpet bombing the vast hummus fields in the deserts of Iraq and Iran would be a death blow to Isis. "We can only make America great again when we've eliminated hummus completely." Local Iowa supermarkets were immediately overrun by Trump supporters, who gathered up all the hummus they could carry. Large piles of hummus containers were stacked up in parking lots, doused with gasoline, and lit on fire. We interviewed one supporter who said; "We need to do whatever The Donald says, cuz he's our only hope to make America white... I mean great... again. Smell that smoke? It smells like victory!" To this reporter it just smelled like burnt garlic with a hint of lemon. When my stress level hits Defcon 1 and I think I'm going to pop a blood vessel, nothing mellows me out like contemplating the duck. I sit and watch his random journey around the pool; sometimes he zooms along, propelled by the filter jets, and other times he moves at a more leisurely pace, slowly spinning and rocking as he reaches the outer limits of the current, only to be scooped up by the next jet and sent rocketing away again. Will he spin left or right when he gets caught in the next eddy? Will the siren song of the skimmer call him to its bosom, or will he zoom past on another lap? It’s all so arbitrary, and yet so familiar and calming. The smell of the yard and gardens mingling with the faint odor of chlorine, the trees rustling on a gentle breeze, the duck spinning and drifting. Is that the cardinals I hear? My mind spins and drifts with the duck, and the stress of the day drops from my shoulders with each passing moment. We just saw an amazing weekend of football, and the Conference Championships coming up this weekend promise to be even better. Two old school elite quarterbacks squaring off in the AFC, and two young up and comers squaring off in the NFC. No matter which teams come out on top this week, we’re guaranteed to see a matchup of the old and new guard at the Meadowlands on Super Bowl Sunday. This will also be the first Super Bowl to be played outdoors in cold weather, the first played outdoors on artificial turf since Super Bowl X, and the first hosted by two states (New York and New Jersey). Pretty cool. I’m hoping the Patriots win this weekend and are able to be a part of this historic Super Bowl, and I think they stand a pretty good chance. 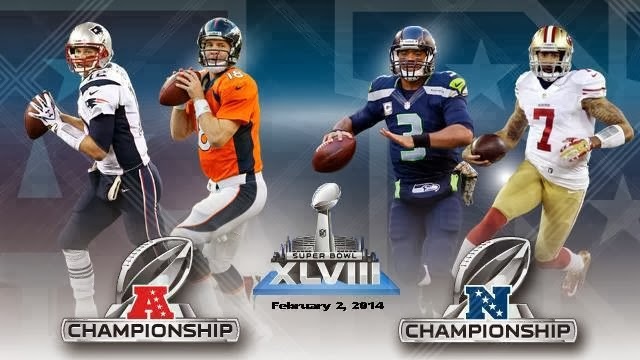 Of course, the game can go either way; both QB's are amazing, both teams are hot and playing hard, but that being said, I believe the Pats will edge out the Broncos and continue their march to the Meadowlands. After many false starts and personnel changes, this team has finally found its identity as a hardnosed, hard running, power football team with an elite quarterback and coach. If the Pats can get the running game going it will open up the play action, and it will keep Peyton off the field. A healthy dose of Blount Force Trauma, passing with surgical precision off the play action, and some really smart defense are the keys to their success. You also have to take into account the intangibles. Brady is money in the big game, Belichick is a chess master who can neutralize the opponent’s key players and make adjustments on the fly, and the Pats are an inspired team on quite a few levels. You have the whole "next man up" attitude that Bill has fostered throughout the season; no matter who goes down, the next man up fills the role and shines, and the team takes great pride in this. The team also draws inspiration from the fan base. The organization is always bringing in local heroes to talk to the team. Great examples from this season are the Marathon victims and Sam Berns, who passed last Friday. There’s no greater motivator then every day heroes, and it seems to be having a pretty big influence on this team. You have to admire the whole Patriots organization, not just for the amazing turnaround, but also for how they give back to the community. Lastly, there’s a whole lot of pressure on Peyton this week; he’s been known for giving it up in the big game, and there’s no other coach and QB tandem that have vexed him more throughout his career. Some would say his legacy hangs on this performance, and that’s a whole lot of weight to carry. This will be a fantastic game. Peyton and the Broncos are formidable foes, and as I said before, it can go either way, but the Pats winning it all wouldn't surprise me in the least, and taking them for granted in this game would be a big mistake. There's a real parallel between the Pats season and the Red Sox season, and we all know how that turned out; last place team of cast offs, who against all odds turned the league upside down and became world champs. Oh yeah, that was sweet. So, my prediction for this Sunday is Pats over Broncos in a close and hard fought game, somewhere in the neighborhood of 31 to 28, Pats. I’m also picking San Fran over the Seahawks in an equally close game. Both NFC teams are good, but I just don’t think that Pete Carroll has what it takes to close the deal and win the big one. Pats vs. Niners at the Meadowlands, count on it. 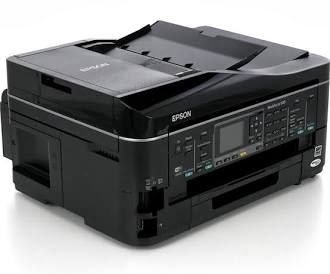 Before I upgraded to a network printer, I used to use a manual USB switch to flip my old printer back and forth between devices. With the fixed location desktops it wasn’t such a big deal, but when it came to our laptops, it was a real pain; you had to be physically next to the printer to plug into one of the USB ports, and that kinda took all the fun and portability out of the laptop. With networked printers you can print from anywhere. Using the laptop in another room? No problem, just connect to the Wi-Fi and bam, your printer is mounted on your device. You can even print from other networked devices like smartphones and tablets the same way, something that wasn’t possible in the old USB printer days. Wicked awesome. So, what’s the down side, you ask? Well, I’ve found a couple of problems that you probably won’t find listed in the installation manual. The first and most common problem is the “disappearing printer”. This is usually caused by the printer’s IP address changing. If you set the printer up using the DHCP network option, it will pull a random IP address from your router. Most routers will save an IP for use by a device for a short period of time, but if you were to leave the printer off for a few days, this temporary lease expires. Meanwhile, if you have lots of networked devices in your house like we do, i.e. smartphones, tablets, smart TV’s, iPods, something else is liable to grab the IP that the printer had used during setup. Next time you turn on the printer, it grabs a different address, and your devices can’t find it. This can also happen if you swap out your router or switch due to malfunction or ISP change. There are a few fixes for this one. You can uninstall the printer on your device and then reinstall it, Windows will find it and make note of the new IP. The problem with this fix is that the printer is liable to “disappear” again the next time you leave it off for a while. The best solution is to either assign the printer a Static (permanent) IP address, or leave it in DHCP mode and create an IP lease or reservation on your router port. If you decide to use a Static address, you need to use an address from the top of your router’s IP address range, a number that your router would never reach when it’s handing them out. Don’t panic, the fix for this one is simple. Instead of double clicking on the scanner icon, right click on it and select “Run as administrator” from the drop down. The system will prompt you to enter your admin credentials, and then you’re off and scanning. Ok, last problem, this one is with faxing. Faxing is old school, I know, but sometimes you just gotta do it. A lot of banks and state and federal agencies insist that you fax documents to them, it’s got to do with them not recognizing the validity of digital signatures. I’ve faxed successfully numerous times, so I know the function works, but recently I needed to fax some documents and I wasn’t having any luck. I’d hear the other end pick up and start its crazy screeching, but after a minute or so my printer would hang up the line and show a “could not connect” message on the little LCD screen. Frustrating. The most common problems with faxing are a either a staticky line, or a fax machine mismatch. The fix for a staticky line is to turn ECM (error correction mode) on if it’s not already enabled. The fax machine mismatch problem is remedied by turning off the V.34 option in the fax setup. This setting has to do with the line modulation technique that the machines use during the fax modem handshake, or screech. When they’re wailing their love cries at each other, they’re really negotiating a connection speed. V.34 allows for a transmission rate of up to 28,800 bit/s, heady stuff in the fax world, and if the fax machine on the other end is an old standalone fax and not a new multifunction device, it’s just gonna say “huh?”, and drop you like a hot potato. Don’t forget to turn it back on when you’re done, though. Although 28,800 bit/s doesn’t seem very fast in these days of Gigabit Ethernet, it’s infinitely faster than the faxing alternatives, which can be as low as 2400 bit/s, and that’s slower than a herd of turtles. Ok, that’s it. I’ve skimmed through these fixes because the specifics depend on your brand of router and printer. If you need more detailed info you can go to the device’s website, but at least now you have a starting point. Happy printing! Not Such Deep Thoughts; Be Gone 2013! It’s been a long strange year, and one that I’m very glad to see go. Heading into 2013 I had some trepidations, not that I’m actually triskaidekaphobic, mind you, but that 13 stuck in my mind, and it made me feel a little uneasy. Well, it turned out that my uneasy feeling was a bit of a premonition. I spent most of 2013 in and out of hospitals, and for a while there I was a little unsure if my life would ever return to normal. It did though, at least to some degree, and I learned a few very valuable lessons along the way. First and foremost, I learned that whatever befalls us, it could be worse, and I learned this little lesson via a 2013 tragedy of horrific proportions. Funny how life works sometimes, the strange coincidences that happen. I was in a local hospital, things were going from bad to worse, and the decision was made to move me to a large Boston hospital. It was a Sunday just before a holiday; Patriots Day, otherwise known as Marathon Monday, to be exact. Time spools out, as it always does in these situations, no room at the inn, etcetera, etcetera, you know the drill. Sunday becomes Monday, Monday drones on. My consolation is an 11am Red Sox game and my little magic plunger; relief is just a click, click, click away. About half way through the game word comes that my room is ready and an ambulance is on the way. As they unhook me and get me ready to go, I click off the TV so we can concentrate on what we’re being told, then my wife and I sit there in silence and wait. When the paramedics arrive they come into the room very quickly and say something really weird; “Turn on the TV”. “Huh?” is all I can manage at first, but within a few moments I come to understand, as much as you can understand something so awful. The paramedics wanted to get right back into Boston so that they could help out, so they hustled us out and into the ambulance, and my wife and I got a ride we’ll never forget. Things were crazy in the ensuing days, but the one good thing that came out of it all was that I knew that my situation paled in comparison to what others were experiencing, and it made it easy to keep positive and continue on. There’s always someone who has it tougher, always, and that very valuable lesson was seared into my mind. The other things I learned were less jarring, but no less important. When you’re not sure what the future holds for you, and you have lots of down time to think, you tend to focus on the things in your life that are the most important to you, the things you’d miss the most if you never got to do them again. You mentally reorder your life; family and friends become very important, work, not so much, and although it can be very hard for a crabby old man like me to remember, you never, ever want to end things on a bad note with someone you care about, or anyone for that matter, life is just too short. I also learned that little mundane things can become huge life victories, and that’s really helped me to see things differently. I had a really great Christmas, awesome in fact, but the greatest gifts I received this December were not monetary; being able to take a shower without wearing a wet suit, and being able to roll over on my stomach in bed were nothing short of gifts from heaven. That last one was a great gift for my wife also, as I’m one hella-snorer when I sleep on my back. You’re welcome, babe. Speaking of babes, and thank yous, I also learned how much my wife, family and friends care about me, especially my selfless wife, and there is no finer gift. Thank you all from the bottom of my heart. 2013 wasn’t all doom and gloom though. We did have that phenomenal run by the Red Sox, who if you ask me were inspired to overachieve by some of the same things that helped me to carry on, and I think our Patriots are borrowing a little of that magic also. No matter what happens or who they lose, the next man up outperforms the last, and they continue to win. There’s something pretty special about that. I also made it a point to reconnect with as many people in my life as possible. I had plenty of spare time to fill, which made it pretty easy. That, and the fact that my 40th reunion was this year, and it happened to fall perfectly between a pair of surgeries. How lucky is that? It was good to see so many faces from my youth. I find that there’s an interesting side effect that comes from reconnecting with people who hold shared memories with me, regardless of how close you actually were; it reminds me of my family, and how things used to be in my youth, and it brings with it all sorts of bittersweet thoughts and memories. At one point in the weekend we boarded a school bus to take a tour of our home town, and it took all of about 10 minutes for us all to revert back to form, laughing and joking as we travelled back to another time. Amazing. Anyways, on the whole I’m very happy to say goodbye to 2013, and I’m looking forward to a happy and productive 2014. Back to work, back to a normal life. You can’t imagine how much I’ve missed it. Hopefully I won’t lose sight of my 2013 lessons learned as I march my way through the New Year. Normalcy tends to breed complacency, and I’ve come too far to revert to form. Life is way too short to be a self-involved wonk. I hope you all have a safe and happy New Year. Try to take a moment to think about who and what is really important in your life, and what you can do to reorder things a bit, and to let those special people know how you feel. You’ll be glad you did.